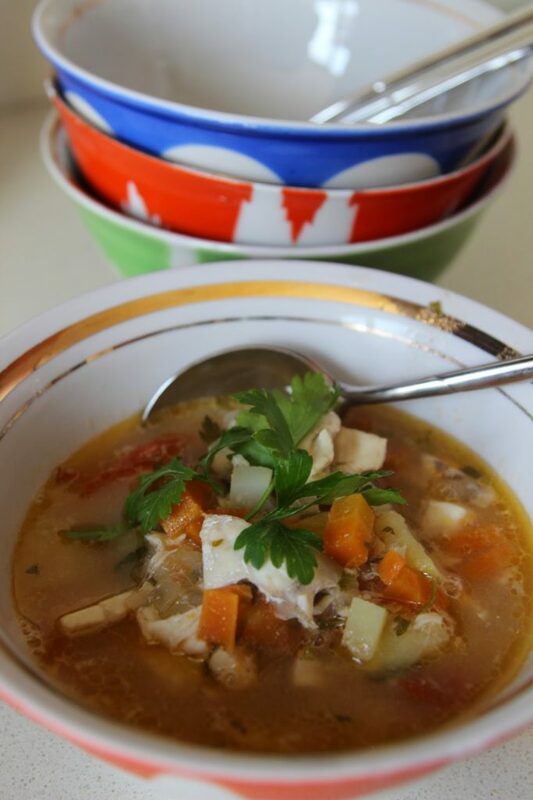 In our house we love soups especially during the colder months. Here’s my latest and we think it’s scrumptious! The traditional Turkish soups lend themselves well to this time of year: lentil, Ezo Gelin and Yayla, full of grains and pulses as they are, tasty and filling not to mention economical. But this time, I went for chunky fish soup. We had fish the other day and the fishmonger included the central bones in the bag. There was still some flesh clinging to them so I couldn’t bring myself just to bin them. Aha I thought. This is a good opportunity to make a good, strong, flavoursome fish stock as I knew that I had a huge fish head in the freezer that I could add. 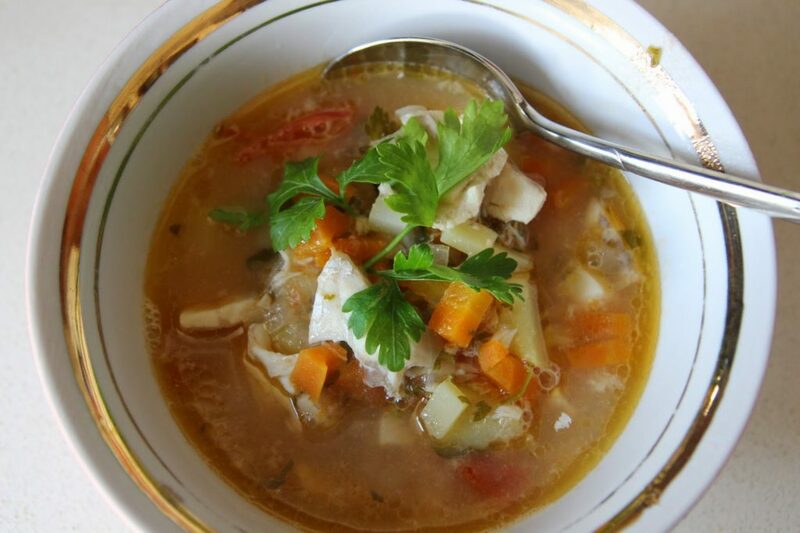 For fish soup you have to have a really good stock otherwise the resulting soup won’t have much taste. 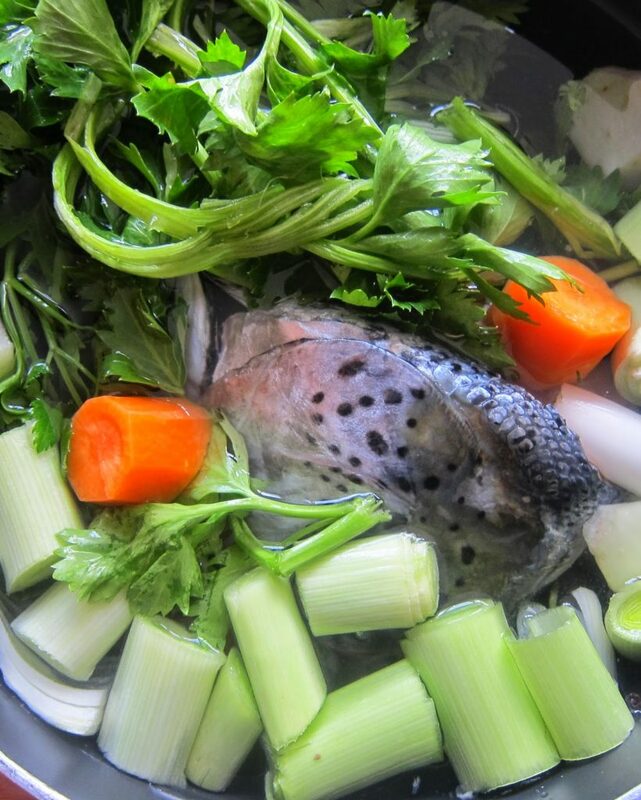 It’s not difficult to make a fish stock. I knew I had all the necessary veg in the fridge as I had just been to the market, so I embarked upon this with gusto. As always for savoury recipes, the exact amount isn’t important: if you don’t have it, don’t beat yourself up about it. The bonus was the appetising fragrance that wafted through the house while it was cooking – not fishy in the slightest. Place the fish bones in a deep pan and cover with 4 pints/8 cups cold water as well as all the other ingredients. Bring the liquid to the boil, lower the heat, cover the pot and simmer gently for about an hour. Carefully skim off any foam that rises to the surface. Add extra water if needed to keep the bones and vegetables covered. Strain or sieve at end of cooking time. Let stock cool, uncovered, before refrigerating. NB Fish stock keeps for up to one week in the refrigerator. You can also freeze it. 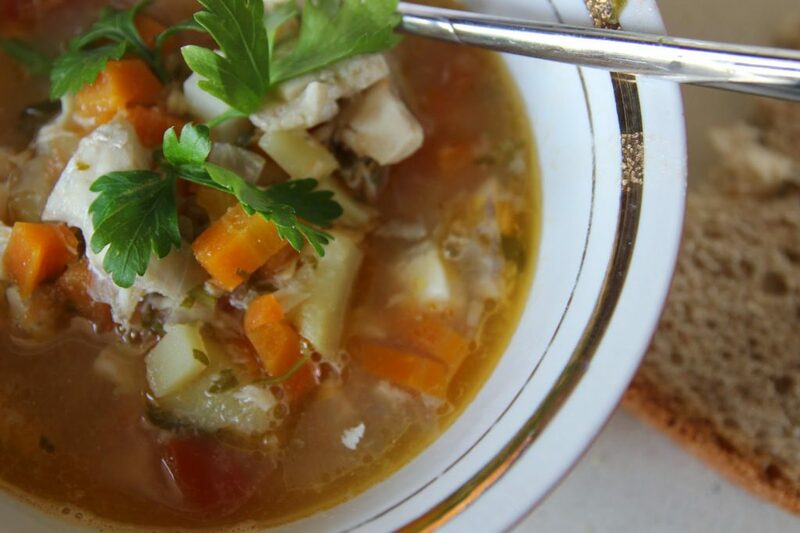 Place the fish chunks and stock in a large saucepan. Bring to the boil, then lower the heat and simmer for about 12 minutes or less if your chunks are small. Using a slotted spoon, remove the fish from the saucepan. Chop it finely, removing any bones, and set aside. Strain the stock into a bowl and set aside. Heat the oil in a large heavy saucepan. Add the onion and garlic and cook them gently, stirring frequently with a wooden spoon, for about 2 minutes, until softened but not browned. Add the reserved stock, potatoes, carrots, celery, and tomatoes. Stir well and bring the mixture to the boil, then lower the heat, cover the saucepan, and simmer for about 20 minutes, or until the vegetables are tender. Add the fish to the pan along with the chopped parsley and dill, flaked red pepper, and lemon juice. Season with salt and pepper. Stir gently and cook for another 5 minutes. Serve hot garnished with more chopped parsley or simply parsley sprigs.